This tour takes us to the tropical paradise island of South Andaman and the Western Ghats on the Indian mainland, two of the finest birding areas on the Indian subcontinent. No other part of India is richer in endemics and near-endemics, and we will target such sought-after species as Andaman Woodpecker, Andaman Scops-owl, Andaman Crake, Black-and-rufous Flycatcher, Nilgiri Laughingthrush and White-bellied Treepie. Day 1 Overnight flight from London to Port Blair, the capital of the Andaman Islands, via Chennai. Day 2 Arrival in Port Blair followed by a short transfer to our comfortable coastal hotel – our base for the next four nights. Port Blair is making a rapid transition from a forgotten outpost to a busy commercial centre, but despite the inevitable accompanying deforestation, some good birds can be found here, in particular along the extensive coastline and adjacent creeks and marshes. We will spend the afternoon exploring a variety of habitats around the town and can expect a good introduction to the islands’ more widespread species, such as Clamorous Reed Warbler, Dusky and Thick-billed Warblers, Long-tailed and Red-breasted Parakeets, White-bellied Sea-eagle, Stork-billed Kingfisher, Watercock, Pacific Reef-heron and, at low tide, a good selection of waders, which may include Wood and Curlew Sandpipers, with a chance of the scarcer Great Knot. Days 3–5 Three further days will be spent making excursions from our base at Port Blair to a series of productive birding sites around the island. At the southernmost tip of South Andaman, Chiriyatapu (literally ‘bird point’) is one of these. A small yet productive patch of coastal rainforest, Chiriyatapu was severely degraded by the 2004 tsunami but is recovering well and is an excellent location for endemics, in particular Andaman Serpent-eagle, Andaman Woodpecker, White-headed Starling and the near-endemic Andaman Coucal. We will also spend time in search of Andaman Crake, foraging among the leaf litter in damp gullies; although not uncommon at Chiriyatapu, this is a highly-elusive species more easily heard than seen. At the point itself, the forest gives way to sandy beaches where Ruddy Turnstone, Lesser and Greater Sand-plovers and, rarely, the impressive Beach Thick-knee can be found. North of Port Blair, Mount Harriet National Park is a small area of dense, tropical evergreen and semi-evergreen rainforest; as most reserves in the Andaman Islands were created to protect marine ecosystems, this is one of the few terrestrial environments to be given true protected status. A narrow road winds its way from the base of the hill to its peak, making this an easy place to bird and allowing easy access to dense forest that provides ideal habitat for a variety of species including most, if not all, of the endemics occurring on South Andaman. Many of these, including Andaman Shama, Andaman Bulbul and, most commonly, the near-endemic Andaman Drongo, associate with species such as Greater Racket-tailed Drongo, Asian Brown Flycatcher, Black-naped Monarch, Asian Fairy-bluebird, Vernal Hanging-parrot, Large Cuckooshrike and Asian Glossy Starling in fast-moving, mixed-species feeding flocks. At lower elevations, Andaman Woodpecker, Andaman Treepie and Andaman Cuckoo-dove can be found in open scrub forest, while dense forest towards the peak is home to White-headed Starling, the near-endemic Andaman Green-pigeon and the scarce and elusive Andaman Wood-pigeon. The summit itself, at 383m, is the highest point on South Andaman and one of the highest in the entire archipelago. This is an exceptional watchpoint for raptors and hirundines, in particular Crested Serpent-eagle, Changeable Hawk-eagle, Glossy and White-nest Swiftlets and White-breasted Woodswallow. Alongside the endemics, the forests host a wide diversity of species including Yellow-browed Warbler, Olive-backed Sunbird, Orange-headed Thrush, Green Imperial-pigeon, Alexandrine Parakeet, Blue-tailed Bee-eater, Small and Scarlet Minivets, Brown Shrike and Spot-breasted Woodpecker. Andaman and Hume’s Boobooks, Andaman Scops-owl and Andaman Nightjar, all endemic to these islands, occur within the sanctuary and we will spend at least one late evening here in an attempt to locate these species as they begin to call at dusk. Throughout the Andamans an extensive network of mangrove-lined tidal creeks and marshes, interspersed with flooded fields and plantations, hosts an incredible range of waterbirds. The archipelago sits along the East Asian–Australasian flyway, which supports an estimated five million migratory shorebirds, making areas such as these vital for wider populations of many species. During our stay on the island we can expect to see species such as Long-toed and Red-necked Stints, Terek and Broad-billed Sandpipers, Bar-tailed Godwit, Whimbrel, Common and Pin-tailed Snipes, Great and Intermediate Egrets, Striated Heron, Cinnamon and Yellow Bitterns, Slaty-breasted Rail, Ruddy-breasted and Baillon’s Crakes, Ruddy, Collared and Black-capped Kingfishers, Mangrove Whistler and good numbers of Andaman Teal among Lesser Whistling-ducks and Cotton Pygmy-geese. Day 6 Today will be a travel day, taking us from the Andaman Islands to the western side of peninsular India. We will make an early start this morning to catch our flight across the Bay of Bengal to the city of Chennai on the east coast of the Indian mainland. From Chennai we will catch a connecting flight to the small town of Coimbatore in the state of Tamil Nadu, followed by a three-hour drive north to the erstwhile colonial hill station of Ooty at a height of 2268m in the rolling Nilgiri Hills, or Blue Mountains. Along the way we will become acquainted with a wide variety of typical southern Indian species, such as Black Kite, Black Drongo, Indian Roller, Green Bee-eater, Laughing Dove, Rose-ringed Parakeet, White-throated Kingfisher, (Eastern) Cattle and Little Egrets and Indian Pond-heron. We will arrive by evening to spend the night in a comfortable heritage hotel on the edge of Ooty. Day 7 Ooty, with its pleasant summer climate, was originally developed as a retreat to escape the oppressive heat of the plains. The town still serves this purpose, and is one of India’s primary tourist destinations in the summer months. During the winter, when temperatures are cooler, the town is deserted, making Ooty the perfect place to look for the resident endemics of these hills. Although Ooty’s native forests have been largely replaced by tea, eucalyptus, conifers and vast arable farms, some small fragments of montane shola remain. A shola is a patch of high-altitude, stunted temperate forest that exists in a sheltered valley or fold created by rugged terrain; each patch is isolated from the next by extensive rolling grassland. This environment, unique to the southern portion of the Western Ghats, is home to some of the endemic species with the most restricted ranges – those with an affinity only to the evergreen forests of north-east India or south-east Asia, and in many cases nowhere else in the world. Ooty’s sholas provide refuge to the more altitude-dependent endemics of the Western Ghats, in particular the striking Black-and-rufous Flycatcher, Nilgiri Shortwing, the nomadic Nilgiri Wood-pigeon and perhaps the most difficult of all, Nilgiri Thrush. We will spend the morning at Ooty exploring these remnant sholas in addition to paying a visit to the nearby Doddabetta (literally ‘big mountain’), the ghats’ second highest peak at 2638m. This is an excellent place to find Nilgiri Laughingthrush, which is often confiding here yet difficult to find elsewhere. By late morning we will leave Ooty, descending through the foothills to Mudumalai National Park. The drive will take us along roads flanked with bird-rich forests, and there are likely to be numerous distractions along the way. Mudumalai was southern India’s first wildlife sanctuary and today forms an integral part of the larger Nilgiri Biosphere Reserve, aimed at preserving some of the finest forest remaining in this region. The reserve encompasses the foothills of the Nilgiri Hills, extending from the moist tropical forest of the western slopes of the Ghats to the tropical dry forest of the eastern slopes and into the dry deciduous forests and tropical thorn scrub of the Deccan plateau inland. Forested hills, valleys and scrub-filled ravines are interspersed with streams and marsh, and the varied habitats make this productive birding country. We will spend the afternoon around Mudumalai, where we hope to find the endemic Malabar Lark, Nilgiri Flowerpecker, Malabar Woodshrike and Grey-headed Bulbul as well as the highly-localised White-bellied Minivet, for which Mudumalai is a known stronghold. Mudumalai is home to a host of additional species, many of which we are unlikely to see elsewhere, including Tawny-bellied, Yellow-billed and Yellow-eyed Babblers, White-browed Bulbul, Indian Nuthatch, Blue-faced Malkoha, Bay-backed Shrike, Bar-winged Flycatcher-shrike, Black-headed Cuckooshrike, numerous woodpeckers including Streak-throated, Yellow-crowned and Brown-capped, Lesser Yellownape, Jerdon’s Bushlark, Painted Spurfowl and Grey Francolin. In addition, Mudumalai hosts one of the largest populations of Asian Elephant in India, and we are likely to encounter these among a good selection of other mammals including Southern Plains Grey Langur, Bonnet Macaque, Sambar, Spotted Deer, Indian Muntjac, Wild Boar and Malabar Giant Squirrel. Overnight in a comfortable wildlife lodge on the edge of the sanctuary. Day 8 We will spend the morning at Mudumalai before returning to Ooty. Depending on the species we have seen and any particular targets we have so far missed, we have some flexibility today in the departure time, but we hope to arrive in Ooty in time to spend at least an hour or two birding around the town. Additional species we may see in the area include Indian Scimitar-babbler, Indian Blackbird, Southern Hill Myna, Mountain Imperial-pigeon, White-bellied Blue Flycatcher, Rusty-tailed Flycatcher, Grey-headed Canary-flycatcher, Large-billed Leaf Warbler and Western Crowned and Greenish Warblers, Yellow-browed and Square-tailed Bulbuls, Velvet-fronted Nuthatch, Common Rosefinch, Forest Wagtail and Grey Junglefowl, while Ooty is also perhaps the only reliable place in southern India to find wintering Kashmir Flycatcher, a species otherwise found only in Sri Lanka during the winter months. Overnight in the comfortable heritage hotel on the edge of Ooty. Day 9 We will leave Ooty early this morning to embark on a seven-hour drive south to Munnar. The journey will take us from the Nilgiri Hills of Tamil Nadu into the Cardamom Hills of the neighbouring state of Kerala. Although we have a long drive ahead, we will make some stops along the way. If there is time, we will spend an hour or two in the afternoon at Chinnar Wildlife Sanctuary. In contrast to most protected areas within the Western Ghats, Chinnar lies in the rain shadow of the ghats. The vegetation here is a rich combination of coastal Malabar and peninsular Deccan elements, dominated by thorn scrub and dry deciduous forest, making it hugely ecologically important as a pocket of this distinct habitat type. The rugged terrain within the sanctuary is dissected by two perennial rivers whose riparian forests support a healthy population of Grizzled Giant Squirrels. Spot-bellied and Eurasian Eagle-owls and Brown Fish-owl can be found at roost here, while the striking Black Baza, White-naped and Rufous Woodpeckers, Blue-bearded Bee-eater, Sirkeer Malkoha, White-rumped Shama and Rain Quail are among other interesting inhabitants. We will arrive in Munnar in the evening and will spend three nights in a comfortable mountainside resort on the outskirts of the town. Days 10–11 Located at an elevation of 1600m Munnar, like Ooty, is a former British colonial hill station. The surrounding hills are uniquely picturesque, enveloped by vast expanses of carefully manicured tea plantation; although these have replaced much of the natural vegetation of the area, the vista they have created is spectacular, and the resultant combination of open grassland and vegetated gullies amidst the tea and patches of woodland shading cardamom crops has allowed a variety of species to flourish here. We have two days to spend at Munnar and will begin our birding around the town itself. Malabar Whistling-thrush, Rufous Babbler, Blue-capped Rock-thrush and Painted Bush-quail can be found foraging in the understorey at tea estates, while Bonelli’s and Black Eagles, Alpine and Blyth’s Swifts and Brown-backed Needletail are regularly seen over the hillslopes alongside Indian Swiftlet and Hill Swallow, both endemic to the Western Ghats and Sri Lanka. Much of our time in Munnar will, however, be spent on upland plateaus and in patches of protected native shola forest in the surrounding hills. We will also visit Pampadum Shola, a small patch of forest of significance as a refuge for the endemic and elusive Nilgiri Marten. Among these shola–grassland mosaics, we will be looking in particular for White-bellied Shortwing, Palani (formerly Kerala) Laughingthrush, Nilgiri Flycatcher and Nilgiri Pipit, as well as one of the most elusive of the region’s endemics, Broad-tailed Grassbird, which may take special effort to find. We are also likely to encounter a good selection of mammals, which, alongside Nilgiri Tahr, may include the endemic Nilgiri Langur and the Nilgiri race of Dusky Palm Squirrel; endemic butterflies in the area include Red-disc Bushbrown and Palni Four-ring, confined solely to the shola–grassland ecosystem. Munnar also makes a convenient base from which to visit Bodi Ghat, back across the state border in Tamil Nadu. The scrub-covered hills here are home to the highly-localised Yellow-throated Bulbul, restricted to the southern Deccan plateau, alongside White-browed Babbler, White-cheeked Barbet and Purple-rumped and Long-billed Sunbirds. Days 12–14 If necessary, we will spend the early hours of day twelve around Munnar, otherwise we will make our way down through the foothills to our next destination, Thattekad Bird Sanctuary. We will spend the remainder of day twelve and the whole of days thirteen and fourteen birding within this small yet productive patch of lush lowland forest. Thattekad, also known as the Salim Ali Bird Sanctuary in honour of the eminent Indian ornithologist who once described this as ‘the richest bird habitat in peninsular India, comparable only with the eastern Himalayas,’ is located on the northern bank of the Periyar River. The sanctuary preserves a vital remnant of a habitat once extant across much of this region but now largely converted to agricultural land and the extensive plantations that characterise Kerala’s lowlands and dominate the surrounding areas. The low-lying, gently undulating terrain nestling against the foot of the Cardamom Hills is densely covered with tropical deciduous and evergreen forest and dissected by a network of seasonal streams, riverine vegetation, bamboo brakes and patches of scrub and grassland; as a result, its birdlife is rich and varied. Specialities here include a significant number of Western Ghats endemics, including White-bellied Treepie, Flame-throated Bulbul, the scarce Wynaad Laughingthrush, Malabar Grey Hornbill, Malabar Barbet, Malabar Parakeet, Crimson-backed Sunbird and the near-endemic Grey-fronted Green-pigeon. 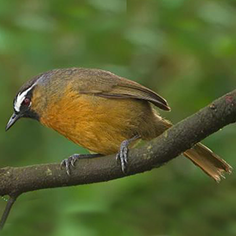 We will also encounter some more widely distributed regional endemics that occur in both the Western Ghats and into Sri Lanka, including Malabar Trogon, Malabar Pied-hornbill, Dark-fronted Babbler and Black-throated Munia. Endemics aside, Thattekad is enormously rich in birdlife, and other species of note include the impressive Great Hornbill, White-bellied Woodpecker, the diminutive Heart-spotted Woodpecker and Speckled Piculet, Black-naped, Black-hooded and Indian Golden Orioles, Dollarbird, Tickell’s Blue Flycatcher, Blue-throated Flycatcher, Indian Blue Robin, the ground-skulking Puff-throated Babbler, Asian Emerald Dove, Indian Pitta, Malabar Starling, Red Spurfowl, White-rumped Needletail and Grey-headed Fish-eagle. The sanctuary and surrounding areas are exceptional for night birds, and we will place particular emphasis on finding these during our stay. Target species include Sri Lanka Frogmouth and Oriental Scops-owl, and there are good chances here for the scarce and elusive Mottled Wood-owl and the highly-secretive Sri Lanka Bay-owl, as well as Great Eared-nightjar, Jerdon’s, Jungle and Savanna Nightjars. The damp, humid forests are extremely rich in exquisite butterflies, which include endemics such as Malabar Rose, Malabar Banded Swallowtail and Malabar Banded Peacock. Mammals are equally numerous, and we may see Barking Deer, Wild Boar, the nocturnal and secretive Travancore Flying Squirrel and Asian Elephant. Three nights in a comfortable tented (permanent) wildlife camp on the edge of the sanctuary. Day 15 We will leave Thattekad after breakfast this morning and take a two-hour drive along the Malabar coast of south-west India to Kochi, birding en route. We will arrive in Kochi in time for lunch then check into our hotel early afternoon as we need to catch our international flight back to London very early next morning. Day 16 Early morning flight back to London at the end of the tour. General Information India is quite hot at this time of year but rain is unlikely. The pace is easy but the heat can be tiring at times. On most days we will split the birding into two sessions, with a break in the middle of the day so we can take time off to relax. There are a number of health requirements and you must consult your GP in this respect. Insects are not a major problem but you must take precautions to avoid other health risks. Accommodation is in medium-standard hotels, all with private facilities. Visas are required. Price includes return flights between London and Chennai and internally in India, all ground transport in India, accommodation in twin-bedded rooms with private facilities where available, all meals and all guiding services. Excluded are insurance, visas, alcoholic drinks, gratuities and items of a purely personal nature.